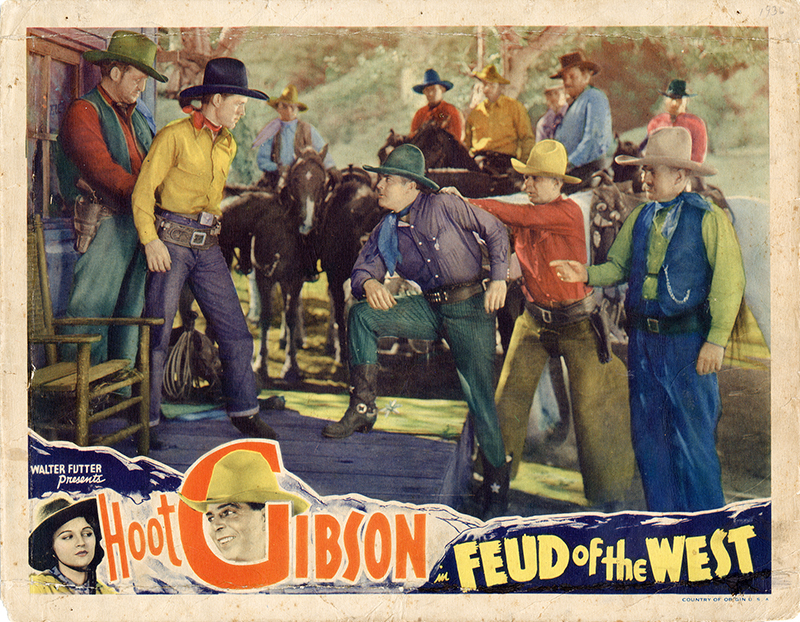 SCVHistory.com LW3175 | Film-Arts | Lobby Card: Hoot Gibson Stars in 'Feud of the West,' 1936. Hoot Gibson stars in Harry L. Fraser's "Feud of the West" (1936), filmed on location at Vasquez Rocks and elsewhere in the Santa Clarita Valley (we don't know where). Newhall resident and onetime child actor Buzz Barton is in the yellow shirt at left. "Feud of the West" premiered, ironically enough, on tax day (April 15), 1936 — at a time when Gibson was going through some difficulties personally and financially and no longer owned the Baker Ranch, which would become the Saugus Speedway. Necessity drove him to take roles in "B" (budget) pictures like this one from Walter Futter's Poverty Row production company, Diversion Pictures Inc., which distributed its product under the states rights sytem. "In the states rights method, producers sold their films on a territorial basis to a local salesperson who extracted as much money as possible from the movie until the worn and scratched film print literally fell apart from sheer use. ... Copyright holders sold the actual copies of their movies; films were sold by their length, usually 10 cents per linear foot of film. This method was ideal for short films that had brief stays in the nickelodeons. But for feature film distribution, states rights proved ineffective. The producer made money on the initial sale of the film print, but the states rights salesperson reaped the largest rewards. Producers had slim profit margins while many films failed to return their costs." "Feud of the West" is written by Russell A. Bankson (story) and Phil Dunham (screenplay). The credited cast includes Buzz Barton, Bob Kortman, Ed Cassidy, Joan Barclay, Nelson McDowell, Reed Howes, Lew Meehan and Roger Williams. Uncredited cast members are Budd Buster, Frank Ellis, William Gould, Allen Greer, Lew Kelly, Cliff Parkinson, Francis Walker and Slim Whitaker. Stunt performers are Cliff Parkinson	and Francis Walker. LW3175: 9600 dpi jpeg from original lobby card purchased by Leon Worden.